"Our goal is simple: to empower parents and children to communicate clearly with one another and experience the profound bonding that results!" 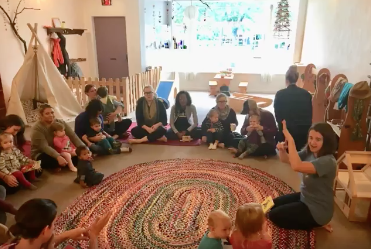 Kelly Konieczki, founder of Momcat’s Signing Academy, began teaching Sign and Play Classes in 2011 in Grosse Pointe and has expanded throughout the Metro-Detroit community offering Story Times and other Enrichment programming. She is a Signing Time Academy Instructor, Certified through the award-winning Baby Signing Time! and Signing Time! programs, as well as the Associate Director of the Academy. She is also a member of NAEYC: National Association for the Education of Young Children and is Certified in Adult and Pediatric First Aid/CPR/AED through the American Red Cross. Kelly is driven to spread the word about the power of signing and demonstrate how it is beneficial and FUN for ALL children regardless of their age or ability. The experience she’s had signing with her daughter inspired her to become an instructor and she looks forward to sharing the same amazing benefits with you and your family! Amy has a bachelor’s degree in Elementary Education with an endorsement in Language Arts and a master’s degree in Special Education with an endorsement in Autism Spectrum Disorder from Oakland University. She has always enjoyed working with kids of all ages and took many classes in Early Childhood Development when completing her Master’s degree. Amy developed our sensory based play and sign class called "Little Wonders." She also teaches classes at Nature's Playhouse and Detroit Mama Hub. Mollie began practicing Yoga in 2002 while living in the U.S. Virgin Islands. It was there that she was inspired by her teacher to complete teacher training herself upon moving back to Michigan. Mollie is a RYT 200 Certified Yoga Instructor. She started taking her children to classes taught at Momcat’s Signing Academy and immediately knew she wanted more signing in all of their lives! She got her Baby Signing Time Certification in 2015 and began combining her love of Yoga and Signing. Mollie regularly teaches at Full Lotus Yoga.